Whether you picked up your first tennis racket at a very young age, grasped onto the game in your teens or were enticed to slap that fuzzy yellow ball around during your adult years, you chose a sport, activity and community which offers so very much. Take it as far as you want or just go out there and enjoy the game. There are so many different levels of competition and play out there - most anyone will find their groove once they realize tennis is a fun, challenging and physically rewarding sport. Tennis provides a means for you to increase and maintain endurance, agility, balance, coordination and muscular reflex and strength; all of which, at a minimum, makes you more fit, more alert and keeps that mass between your ears, sharper than a tack. Hey, this is a sport and it can get very competitive out there between the lines, but you'll never meet a better bunch of people, on or off the tennis court. We all want to go out there, give it our best and win a few for our team, but we also like to have fun and take advantage of our common interest in tennis beyond the fences. 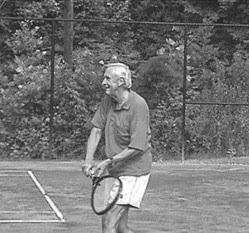 Whether or not you are in your 20's or 30's, or enjoying life in your 40's and beyond, you can look forward to a life of fitness and fun playing tennis, no matter where you live. Bill Ingbretsen, pictured left, was selected as example of how physical activity not only augments one's living years, yet enhances quality of life. This picture is from the book, Aging in the New Millennium, A Global View. Bill Ingbretsen was 75+ in this photo and still has "good game" nearly five years later - I've played against him often. At the time, he could compete and beat equally rated players half his age and he still continues to give his peers much trouble while on court.